“Last Sunday we held the last qualification round of the Best of The West Skateboard cup in Roeselare. It was a stormy and cold outside, but skateboarding was hot inside. Again hundreds of skateboarders came to watch and participate in the BOTW cup. The qualification runs of the sponsored riders were of a real high level. 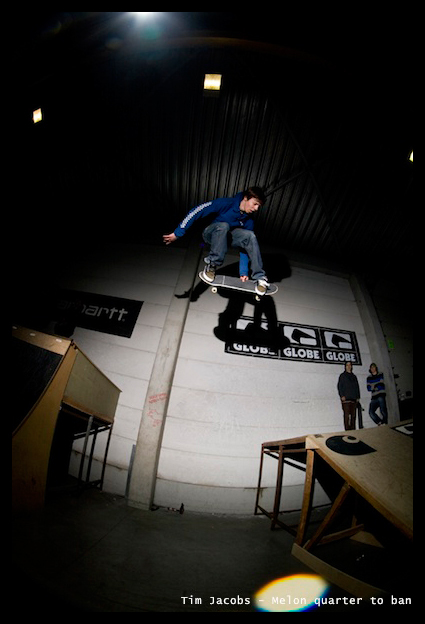 Stand outs were Koenraad Helsen, bs nollie 270 heelflip over the hip. Jonathan Thijs, crooked bs 180 out at speed mach 10 and Tim Jacobs taking his bowl skills to the streetcourse with a huge transfer quarter to bank. In the finals Jonathan skated a real solid run and nailed 20 tricks during the jam session. 1st place for Jonathan Thijs from Leuven. His homie Tim Jacobs came in second. Dirty South Mo got a well deserved third place. Watch all results & picture on the official BOTW webpage. After four qualifying contest this is the ranking. All skaters in grey and green are directly qualified for the semifinals on Sunday. If you ‘re not one of these 12 you still might have a small chance to skate the Zumiez Finals. There will be a last qualification session for unsponsored skaters at 12h and one for the sponsored skaters at 13h. 3 wildcards will be handed out to the 3 best skaters of each category. Semifinals nonsponsored start at 14h. Find all practical info about the finals here. Who’s gonna be the overall winner? Find out yourself and come to Zumiez on Sunday and witness the Best Of The West spectacle. Entry is free, toasts, sausages & beers available on the spot. Don’t miss out on this one!